The loss of all aboard a Metrojet Airbus A321 over the Sinai Peninsula on Saturday was bizarre from the beginning, as any aircraft lost suddenly at cruising altitude would be. Yet maybe the most puzzling thing has been the haphazard Russian-Egyptian-Metrojet investigation into the crash thus far. With so many fragmented theories flying around, here are all the possibilities of what could have brought down Kogalymavia Flight 9268. 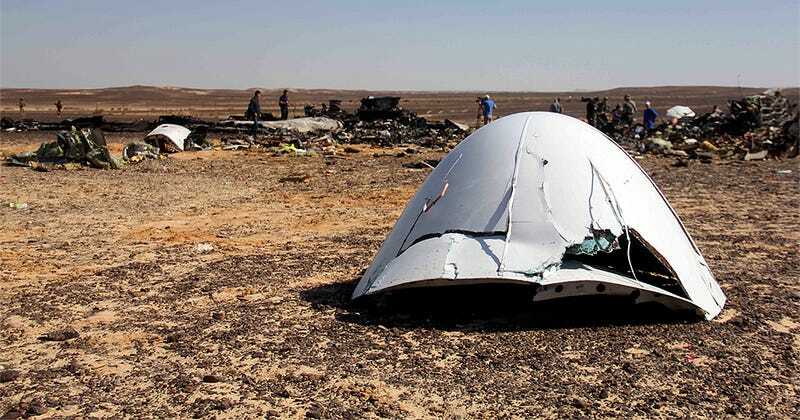 The administrative response to the loss of the Metrojet A321 has been bizarre, with different, and seemingly highly premature messages coming out of Egyptian and Metrojet camps separately. There seems to be political and economic forces at play in these responses. On one hand, early on Egypt was quick to play-down the idea that terrorism caused the crash. This could be an attempt to protect its struggling tourism industry. Metrojet’s leadership on the other hand has come out and pretty much declared the incident anything but a mechanical failure, or anything they are responsible for, going so far as saying the crash was caused by an “external impact” on the A321. Russia, which also played down the terrorism possibility early on, seems to now be taking a proper wait-and-see approach as the investigation has barely begun and the information on the aircraft’s very much intact black boxes has not even been accessed yet. So just what could have brought down Kogalymavia Flight 9268? The answer is many things could have brought the jet down, but the first thing that may come to some people’s minds after the loss of MH17 over Ukraine is the possibility that the jet was downed by a surface-to-air missile. ISIS and other extremist elements in the region are known to have man-portable air defense systems (MANPADS), otherwise known as shoulder-fired heat-seeking surface-to-air missiles. In fact, the FAA has warned airliners not to fly below 26,000 feet over the Sinai due to this threat following the loss of an Egytian Mi-17 helicopter by a MANPADS attack. But the Metrojet airliner in question was flying at around 32,000 feet when it began drastically slowing and losing altitude. Even the most modern Russian-designed MANPADS in widespread service, the SA-24 Grinch/9K338 Igla-S, has a ceiling of about 20,000 feet. Taking into account the terrain on the Sinai Peninsula, even if the operator were standing on the top of Mount Catherine, with a peak at just over 8,500 feet and located nowhere near the site of the crash, the SA-24 would not have been able to take down the jet even with a perfect shot. Could such a missile been modified to fly higher? Although it may be possible, it would have been a huge technical achievement and likely an unneeded one. If the warhead and fuse were removed to lighten the missile, it should result in a higher ceiling, although it would throw off the missile’s balance at launch. It is not clear if the an SA-24 would function with its center of gravity so drastically changed. Also, turning a MANPADS into a kinetic weapon alone would most likely have not have resulted in such a quick loss of the A321 in question. If the relatively light missile were to just have impacted the jet alone there should have been ample time to make a distress call. Then there is the question of why any terrorist would go through this level of trouble when they could achieve the same effects with a greater chance of success by just going to somewhere near an airport and taking a shot at an airliner while it was transiting at lower altitudes. In other words, who would fire on an aircraft clearly outside a weapon’s envelope? And who would try to modify such a weapon weapon in hopes of making an impossible shot possible but still with very low odds of success? It makes no sense. What about a larger SAM system capable of achieving more devastating hits on aircraft flying up above the MANPADS envelope? It is extremely unlikely that such a complex system would be able to be maintained and operated by a terror group operating in the rugged Sinai Peninsula, nor is it likely that such a large system would go unnoticed if stolen. If an “all-in-one” tracked SAM system similar to the SA-11 “Buk” that shot down MH17 over Ukraine were lost to ISIS in the region, there would have been a search to find it, and its emissions at the time of the theoretical engagement should have registered with electronic surveillance systems in the region. Especially considering the A321 went down just 25 miles from the constantly watched Israeli border. So if a surface-to-air missile attack is highly unlikely, than what else could have caused an external impact to the Metrojet A321 cruising at 32,000 feet? Although also extremely unlikely, an unmanned aircraft could have theoretically had a accidental mid-air collision with the aircraft. Some American and Israeli drones in particular, and emerging capabilities of other air arms in the region, have the ability to fly unmanned aircraft at altitudes exceeding 30,000. Israeli drones of this nature, however, are the only ones known to operate regularly over the Sinai Peninsula. In fact, they executed air strikes on the peninsula recently, although farther north than where the Metrojet A321 went down. These unmanned aircraft, although not true stealth designs, can feature small radar signatures due to their composite structures and since their operations are largely clandestine, they can fly without their transponders off if they had one at all. If this were the case, the A321’s Traffic Collision Avoidance System (TCAS) would have given the crew no warning of its approach if an accident were to have been imminent. But there’s a big problem with the drone collision theory. There’s been no word of wreckage being found to indicate that such a drone impacted the plane. Although a medium altitude high endurance (MALE) drone’s fuselage may not have remained intact at all after such a collision, its engine core could have remained in one piece, or large pieces of its wings would survive. Additionally, it would have been a huge mistake in mission and risk aversion planning. As such the possibility of an event like this happening is extremely small and a country almost certainly would have admitted to the mistake shortly after it happened. Israel in particular, with its absolutely necessary relationship with Egypt and Russia, would be gravely damaged by such an accident occurring and especially if it were not admitted to shortly after it happened. Then there is also always the whole meteorite possibility, and it is a simple one, going something like this: An exo-atmospheric object enters the earth’s atmosphere strikes an airplane on its descent in such a spot that is causes catastrophic damage to the aircraft in an instant. This has long been a theory held in reserve for seemingly unexplained disappearances of aircraft, although it has never been proven to have actually occurred. Still, there are firsts for many things, and it is possible although very highly improbable that such a unlikely encounter could occur. There have also been no accounts of anyone seeing a meteor streak through the sky at the time of the event, although the crash site’s desolate location could mean such sightings would be very unlikely in the first place. The most likely possibility when it comes to an external factor that could have led to the loss of Kogalymavia Flight 9268 would have been an explosive on-board that caused the aircraft to break apart instantly after it detonated. Russia’s intervention in Syria has put the country in extremist cross-hairs more than ever before, and a device placed inside or even outside the jet’s fuselage could have caused it to instantly disintegrate, even while the jet was at a leisurely cruising altitude. The scenario is especially plausible, considering the aircraft’s high fuel state at the time. A similar disaster occurred on Pan Am Flight 103, which was taken down by a bomb over Lockerbie, Scotland, in 1988. Still, if a planted explosive were the cause of the crash, why have we not heard from the group, or individual that planted it? ISIS had claimed it downed the airliner with a missile, not a bomb. The aircraft’s manifest could bring to light possible suspects, although there has been little talk of it at this time. If none of these theories are true, then we come back to what some involved in the investigation don’t want to comprehend, that the aircraft itself or its crew failed catastrophically in a relatively benign portion of its flight profile. Although this is also unlikely, and there are often human factors leading up to such incidents, as seen on Air France 447 and Aeroflot 593. But the best place to look for a potential modern analogue of a strictly technical issue resulting in the abrupt loss of an airliner is TWA Flight 800, which was lost suddenly to a concentration of explosive vapors in a fuel tank, likely coupled with short circuit. In that case, the aircraft exploded in mid air. Like TWA 800, a fuel or fuel vapor related issue could have caused an explosion, as well as an uncontained engine failure, or something in the aircraft’s cargo hold could have triggered the loss. Even a small explosion by a volatile piece of cargo in a particular area of the jet could break the aircraft up in mid-air. With this in mind, the aircraft’s cargo manifest is of great interest, along with what the passengers had in their baggage, as well as who had access to the aircraft’s cargo compartments before the flight. Finally, there is the possibility that there was a major airframe or flight control failure. Such events are also incredibly rare, but structural failures on airliners have occurred. The possibility that the A321’s redundant fly-by-wire flight controls suddenly gave commands so abrupt that it broke the plane apart is extremely unlikely if not impossible, but if something like that did happen, it could have doomed the jet. Sudden pilot induced inputs can lead to catastrophic consequences, as seen in the loss of American Flight 587. Even a pilot hell-bent on ending their lives and many others could fly an aircraft to the point of structural failure if an intervention were not made. The Metrojet A321 in question was not a young aircraft. It was 18 years old and has amassed 57,000 hours of flight time and about 21,000 pressurization cycles. But even then, age is no indication that something went wrong, and the plane was not far outside the age of aircraft flown by major global airlines. What is interesting, however is that the aircraft in question did experience a tail strike in 2001, not a totally uncommon occurrence for such a long aircraft. It was subsequently repaired and returned to service. If the aircraft were to have had a structural failure for an unforeseen factor related to its tail strike incident years ago, with a catastrophic depressurization occurring or its tail breaking off in flight due to fatigue, the jet would likely have somersaulted through the air. The result of such a violent event could have been a total or partial mid-air break-up, with the of possibly leaving the tail structure fairly intact. A similar incident occurred in 1985 with Japan Airlines Flight 123. The 747SR had a tailstrike seven years before the crash occurred, and it was repaired in faulty manner. When the repair finally gave way, the explosive decompression severed the jet’s flight controls and the vertical stabilizer broke off, dooming the aircraft. With this in mind, the crashed Metrojet A321 maintenance history and the details of the tail strike repair, along with Metrojet’s overall safety and aircraft upkeep policies will all be under sharp review. Patterns of negligence at the corporate level can often trickle down to operations, training standards and even aircraft upkeep, which can clearly factor in such a loss. The United States may actually be able to help in this investigation by providing Russia and Egypt any data from its space-based infrared event detection satellites that are used primarily for identifying ballistic missile launches. These systems are commonly known as the Defense Support Program and the newer, much more capable Space-Based Infrared System, or SBIRS. It is known that the Pentagon has a portion of these satellites staring at Middle East and European area of the world, and they detected the launch of the missile that destroyed MH17 over Ukraine, and the subsequent explosion that took it down. If the Metrojet Airbus in question blew up in flight, it could very well have been identified by these Defense Department assets. By examining the data closer, Pentagon technicians may be able to see if there were two, or even three infrared events, and they may have trajectory tracks of each of them. Depending on where they were located, how many there were, and the capabilities of the satellite that witnessed them, this data could offer a much clearer picture of what happened to the jet. For instance, if three infrared signatures were observed, and especially if they were tracked, that would likely mean a missile shot down the jet. If two events were witnessed, with one being the explosion of the jet and the other being one where the jet impacted the ground, it is more likely that the jet was not attacked with a missile, especially if the system should have been able to detect a missile during its launch phase. As it is so early in the crash investigation we are left with so many questions. But depending on what is discovered in the coming days we should be able to mark some of the possibilities above off and concentrate on what remains. Hopefully, in the end we will have a definitive answer of exactly what happened to Kogalymavia Flight 9268, although that is not guaranteed as we have frustratingly found out with other recent high-profile airliner losses.